We’re delighted to announce that a recent article in Film Studies, issue 14 has been awarded the runner-up prize for best journal article of the year in the BAFTSS AWARDS 2017. ‘Autonomy and Dependency in Two Successful UK Film and Television Companies: An Analysis of RED Production Company and Warp Films’ by Andrew Spicer and Steve Presence was handed the prize at an awards ceremony held during the BAFTSS Conference in Bristol last month. Other winners can be found on the BAFTSS website. Film Studies approaches cinema and the moving image from within the fields of critical, conceptual and historical scholarship. The journal provides a forum for the interdisciplinary, intercultural and intermedial study of film by publishing innovative research of the highest quality. 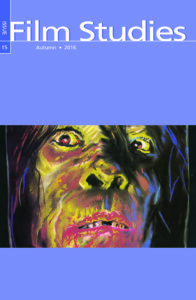 The latest issue (15) takes European Horror Film as its focus, and can be purchsed here. ‘Autonomy and Dependency in Two Successful UK Film and Television Companies: An Analysis of RED Production Company and Warp Films’ is available at a special 20% discount until the end of July.